Intel claims a 4-year lead over competitors in the race to the 20nm process node. 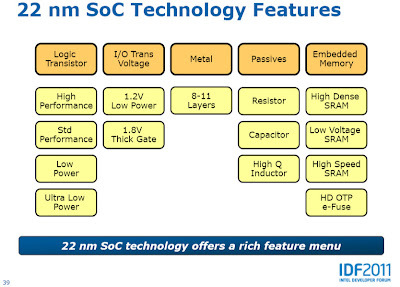 In a session titled "22nm Tri-gate Transistors for Industry-Leading Low Power Capabilities" at the Intel Developer Forum (IDF) yesterday, Intel Senior Fellow Mark Bohr said that the company's FinFET process is 4 years ahead of competitors, including TSMC and the trio of GlobalFoundries, Samsung and IBM (i.e. Common Platform). In explaining Intel's technology lead during the Q&A session following his talk, Bohr went so far as to question whether any other company was yet shipping a high-k metal gate (HKMG) process in volume production - a technology which Intel began shipping in 2007. The comments from Bohr serve as a return volley to comments made by executives at the GlobalFoundries Technology Conference (GTC) in Santa Clara two weeks ago. 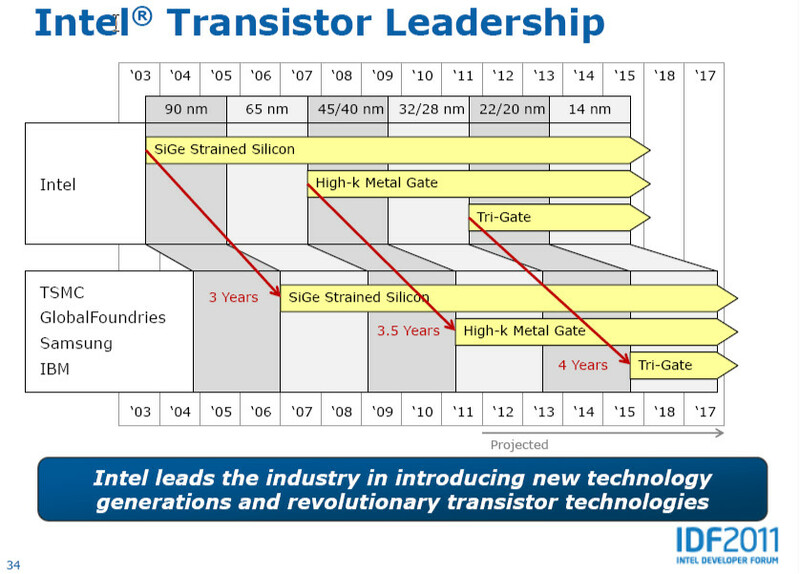 In response to a question at the GTC press/analyst lunch, on the company's choice of HKMG for 20nm technology, GlobalFoundries Senior VP for Technology Gregg Bartlett commented that Tri-Gate is limited to processor-only applications, making it less suitable for the diverse requirements of SoCs. GlobalFoundries also claims to be first foundry to ship HKMG in volume. 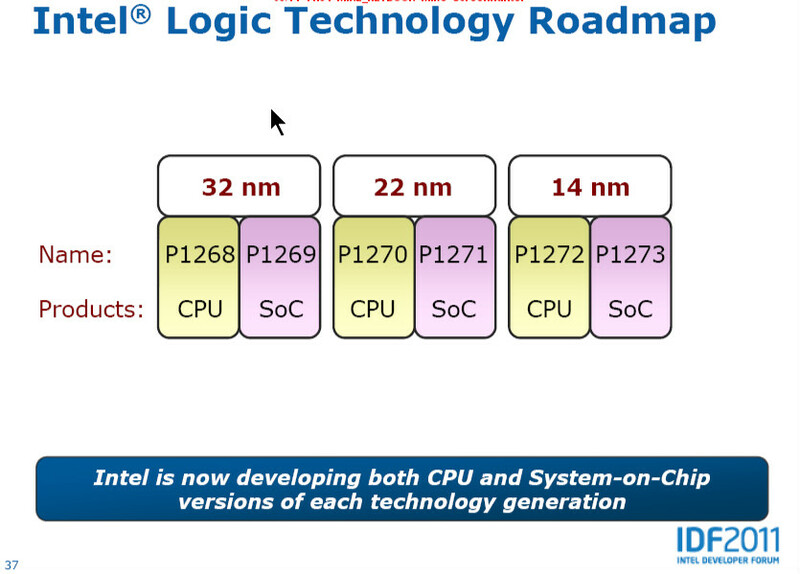 Intel is developing an SoC version of their 22nm Tri-Gate process in parallel with the CPU version. At IDF, Intel disputed the notion of limited applications for the Tri-Gate process, showing that Intel has been developing both CPU and SoC versions in parallel for all process nodes, starting at 32nm. The CPU process emphasizes performance, while the SoC process is optimized for lower power mobile applications. analog and mixed-signal applications for mobile devices. Intel is targeting production of their new Ivy Bridge processor, the successor to Sandy Bridge, in the 22nm Tri-Gate process in Q4 2011. Public availability is targeted for the first half of 2012. 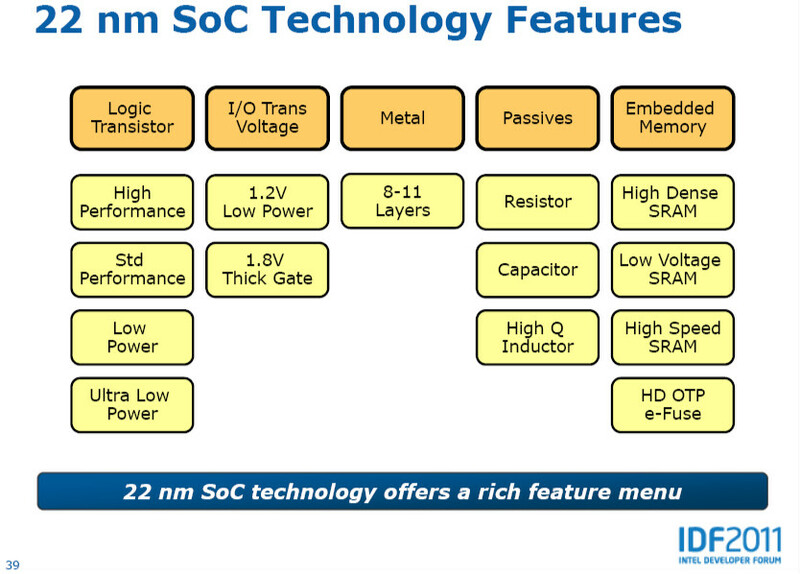 Intel is developing a large number of process options for 22nm Tri-Gate SoC, including higher voltage thick-gate transistors, RLC passive components for analog and RF applications, and embedded one-time programmable (OTP) memory.